Never mind that 100 percent of what you know about the ’20s is derived from that gif of Leonardo DiCaprio raising a glass of champagne in The Great Gatsby. You miss the ’20s. People had class then, and they knew how to have fun. They drank contraband cocktails and they wore flapper dresses and they mostly just danced the Charleston. Too bad the ’20s are gone. Thankfully, there’s a whole subculture in Los Angeles devoted to knowing things about the 1920s—especially the decade’s signature architecture. The Art Deco Society of Los Angeles works to preserve anything with a hint of zigzag or ziggurat styling, and they’re keeping the Jazz Age alive. This weekend, they’re throwing their 12th annual Art Deco Festival on the Queen Mary (itself a vestige of Art Deco design) in Long Beach. The three day fling will be packed out with hundreds of “Deco-philes” in dated formalwear, all getting down to the Lindy Hop. A lump sum of $478/night gets you a room in the ship’s on-board hotel, a full weekend of “vintage” events, and presumably the opportunity to meet hot, Deco-inclined singles. Without the hotel stay, the grand pass is $399, and tickets to events can be purchased individually. 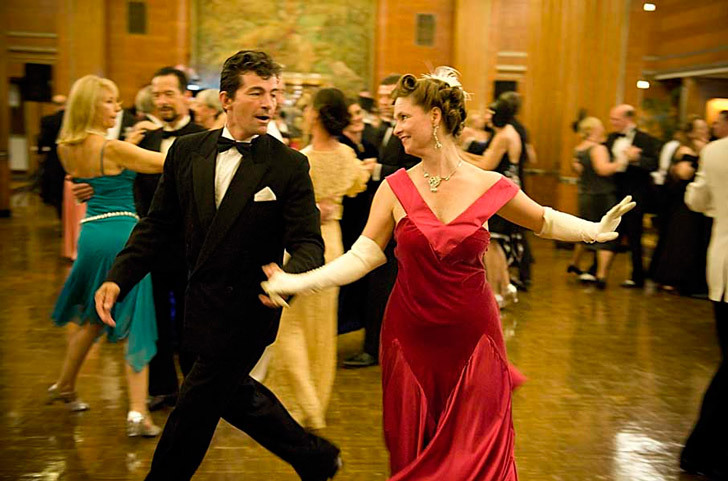 Attractions include a showcase of retro cars, prohibition mixology, era-appropriate hairstyling, soda tastings, a lecture on the history of those Audrey Hepburn cigarette holders, innumerable throwback bands playing Louis Armstrong covers, and a “Deco Derby and Pajama Jam.” It all culminates in the Art Deco Grand Ball, which is like the Yule Ball from the fourth Harry Potter film minus the wizards and guy from Radiohead.